I recently watched a video where a patient defined “hypertension” as “when you’re not able to sit still.” It made me sad—and reminded me (again) why plain language, or clear communication, truly matters. Since our founding in 1975, Healthwise has been committed to producing health information that people can understand. That was years before plain language became a discipline, a movement even, and the worthy focus of conferences, organizations and workshops. 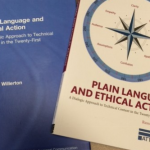 Now there’s a new book on the topic, Plain Language and Ethical Action, by Boise State University technical communications professor Russell Willerton.